(CNSNews.com) - U.S. Customs and Border Protection and U.S. Immigration and Customs Enforcement both caught more criminals who pled guilty or were found guilty in federal district courts in the last fiscal year on record than did the Federal Bureau of Investigation, according to the latest U.S. Attorneys' Annual Statistical Report. In fiscal 2016, according to data published in Table 3D of the report, 66,670 criminals either pleaded guilty or were found guilty in U.S. District Courts. CBP had referred 14,869 of these convicted criminals to U.S. attorneys. That was more than any other federal agency. ICE had referred 10,608. That ranked it second only to CBP. The FBI ranked third, having referred 10,318 of the defendants who pleaded guilty or were found guilty in a U.S. District Court in fiscal 2016. The 14,869 that CBP referred was about 42.4 percent more than the 10,318 the FBI referred. The combined 25,477 who pled guilty or were found guilty in U.S. District Court after their cases were referred to a U.S. attorney by CBP or ICE was almost two and a half times the 10,318 who pled guilty or were found guilty after referrals by the FBI. According to the U.S. Attorney’s Annual Statistical Report, the top five U.S. District Courts for the number of defendants who pleaded guilty or were found guilty in fiscal 2016 were all located along on the U.S.-Mexico border. 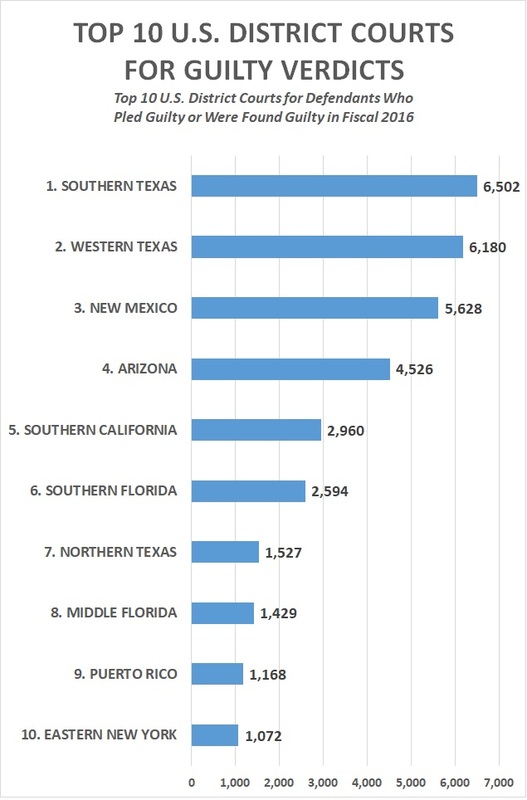 These included the U.S. District Court for the Southern District of Texas (where 6,502 defendants pleaded guilty or were found guilty); Western Texas (6,180); New Mexico (5,628); Arizona (4,526); and Southern California (2,596). 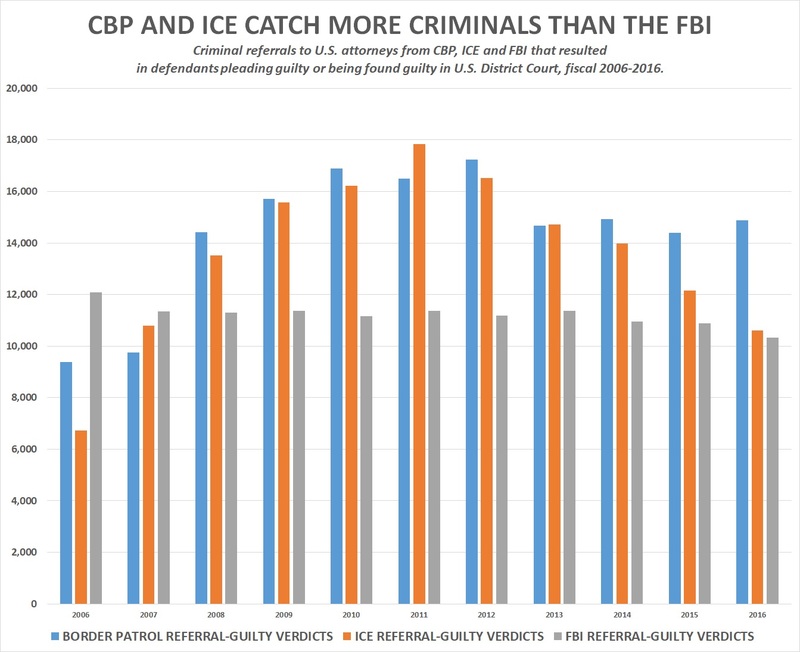 The report also indicates that CBP and ICE both had higher conviction rates on their referrals than the FBI. In fiscal 2016, according to the report, U.S. District Courts terminated the cases of 15,359 defendants referred to U.S. attorneys by CBP. Of these 15,359 individuals, 14,869 pled guilty or were found guilty, 5 were found not guilty, 443 had their cases dismissed and 42 had their cases terminated in what the report calls “other” ways. That means that of the 15,359 defendants referred by CBP whose cases were terminated in fiscal 2016, only 490—or about 3.2 percent—did not end up with a guilty verdict. 96.8 percent of the defendants referred by CBP pled guilty or were found guilty. At the same time, according to the report, U.S. District Courts terminated the cases of 11,244 defendants referred to the U.S. attorneys by ICE. 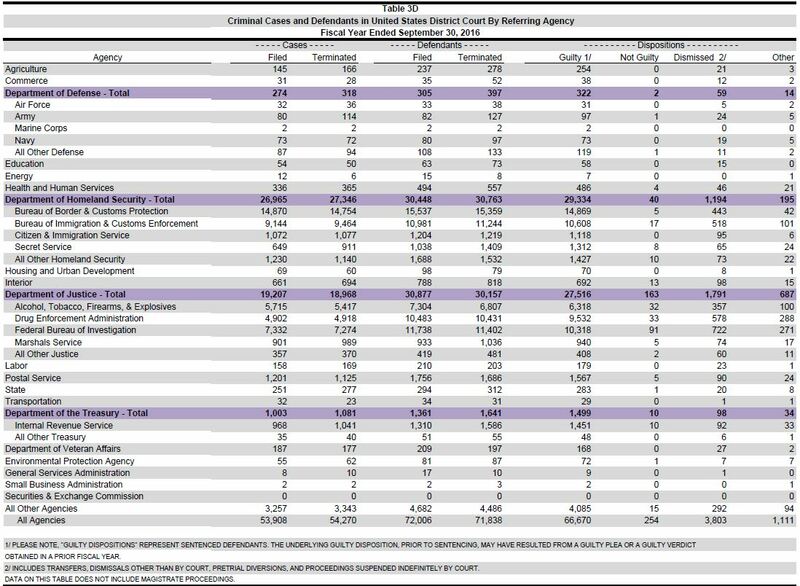 Of these 11,244 individuals, 10,608 pled guilty or were found guilty, 17 were found not guilty, 518 had their cases dismissed and 101 had their cases terminated for “other” reasons. That means that of these 11,244 defendants referred by ICE whose cases were terminated in fiscal 2016, only 636—or about 5.7 percent—did not end up with a guilty verdict. 94.3 percent of the defendants referred by ICE were found guilty. According to the same report, U.S. District Court terminated the cases of 11,402 defendants referred to the U.S. attorneys by the FBI. Of these 11,402 defendants, 10,318 pled guilty or were found guilty, 91 were found not guilty, 722 had their cases dismissed and 271 had their cases terminated for “other” reasons. That means that of these 11,402 defendants referred by the FBI that had their cases terminated in fiscal 2016, there were 1,084—or about 9.5 percent—that did not end up with a guilty verdict. 90.5 percent of the defendants referred by the FBI pled guilty or were found g guilty. In summary, 96.8 percent of the defendants referred by CBP pled guilty or were found guilty in U.S. District Court; 94.3 percent referred by ICE pled guilty or were found guilty; and 90.5 percent referred by the FBI pled guilty or were found guilty. Fiscal 2016 was not the first year CBP and ICE referred to U.S. attorneys more defendants who ended up pleading guilty or being found guilty than did the FBI. In fact, according to past U.S. attorneys’ annual statistical reports, this has been the case in every fiscal year since 2008. Back in fiscal 2006 and 2007, the FBI referred more defendants who pleaded guilty or were found guilty than did CBP and ICE. In 2006, FBI referred 12,085 guilty defendants to CBP’s 9,381 and ICE’s 6,724. In 2007, FBI referred 11,355 to CBP’ 9,758 and ICE’s 10,787. In addition to the defendants U.S. attorneys prosecute in U.S. District Courts, there are also many federal cases now brought in federal magistrate courts. According to the U.S. Attorneys’ Annual Statistical Report for fiscal 2016, these cases were overwhelmingly focused in U.S. court districts along the U.S.-Mexico border. In fiscal 2016, according to the latest report, 58,585 criminal defendants had their cased terminated in U.S. magistrate proceedings. About 82.1 percent of these defendants--48,094 of them—were in just three U.S. court districts: Southern Texas (19,527); Western Texas (15,389); and Arizona (13,178). All three of these districts are on the U.S.-Mexico border. The Department of Homeland Security, which includes CBP and ICE, was authorized in a law signed by President George W. Bush in November 2002—the year after the September 11, 2001 terrorist attacks.